Woodland phlox in habitat in a maple woods in southern Wisconsin. Woodland phlox, Phlox divaricata, is an eastern North American native increasingly offered as an ornamental to use in cultivated gardens for its attractive bluish flowers. This herbaceous perennial in the phlox family (Polemoniaceae) can be found growing in dappled shade in open woods, partially shaded meadows, and along stream banks from Quebec to Florida and west to Texas and the Rockies. This plant, also sometimes is referred to by other common names including blue phlox, Louisiana phlox, wild blue phlox and wild sweet William, is hardy in zones 3 to 8. It is taller and has a more open habit than the very common, sun-loving creeping phlox or moss (P. subulata) and does not spread as quickly as that species does. Another woodland species, P. stolonifera also called creeping phlox, is much shorter at only 6-8 inches tall, forms dense clumps, has oval leaves and fewer lavender to pink blooms in the flower clusters, and is only hardy to zone 5. Phlox stolonifera (L and cultivar ‘Sherwood Purple’, LC) is shorter than P. divaricata. P. subulata, including the cultivars ‘White Delight’ (RC) and ‘Candy Stripe’ (R), is shorter, more compact and needs full sun. 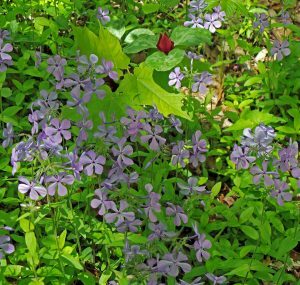 Woodland phlox grows from a shallow root system, slowly spreading over time (divaricata means “with a spreading and straggling habit”). This is one of the only Phlox spp. to have both fertile (flowering) and infertile (non-flowering) shoots. The root system produces stolons which develop into non-flowering shoots as it forms a loose mat of foliage up to a foot high. Stems are hairy and sticky (from glandular hairs) with opposite, sessile, hairy, lance-shaped to elliptic leaves up to 2” long with entire margins arranged in widely spaced pairs. The leafy shoots will root at the nodes if they flop onto the ground, also increasing the spread of the colony. The mostly unbranched flowering stems tend to be longer (to 15 inches tall) and more densely hairy than the infertile shoots, and the leaves on the infertile shoots are generally wider with more rounded tips and less hairy. The flowering stems die back after seeds are produced, leaving a rounded mound of semi-evergreen (in mild climates) dark green foliage to produce and store energy for the development of the following year’s flowering shoots. When not in bloom the plant is fairly nondescript and particularly as it begins to decline in summer could be mistaken for a weed. Woodland phlox shoots in spring (L and R) and closeup of leaves (LC) and hairy foliage (RC). For about a month in late spring to early summer plants produce loose clusters of salverform flowers at the stem tips. Each tubular flower, 1-1½ inches wide, has five flat, petal-like lobes at the end and a hairy green or reddish green calyx with 5 linear teeth. The spreading lobes may be notched (subspecies divaricata, generally in the eastern part of the range) or entire (subspecies laphamii, generally in the western part of the range). There are five stamens and a single pistil recessed inside the narrow corolla throat so are not readily visible. The sweetly fragrant flowers come in shades of blue from pale lavender to violet-blue, and occasionally pastel pink or white. The showy flowers attract butterflies, moths, bees, and flies. Flowers are produced in loose clusters (L two) from furled buds (LC) and may be various colors (R three). The flowers (which require cross-pollination to produce seed) are only pollinated by long-tongued insects including butterflies (especially tiger swallowtails), skippers, hummingbird clearwing and sphinx moths, and bumblebees which are able to reach the nectar produced at the base of the long tube, but the flowers are visited by many other insects that feed on the pollen produced near the end of the tube. Flowers may be followed by rounded fruits that start out green and eventually dry to brown ovoid seed capsules that eventually split to release several small black seeds. This plant will self-sow, but it is not aggressive and unwanted seedlings are easily pulled up or transplanted. After flowering the petals are shed (L) and if pollinated a capsule is produced (LC) with each of the small capsules (RC) eventually splitting to release the small black seeds (R). Phlox divaricata in a woodland garden with red trillium. 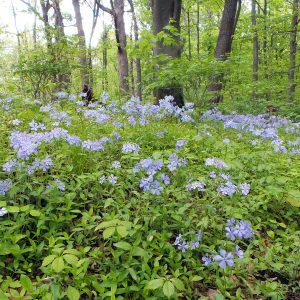 Use woodland phlox in native woodland gardens, naturalized areas, or the front of informal borders and in shady rock gardens. Interplant with early spring bulbs to help disguise the senescing bulb foliage. Use along a path or near a window where the lovely scent can be appreciated when they are in bloom. This species can be used as a loose ground cover, but is not dense enough to outcompete most weeds. It goes well with earlier-blooming spring woodland ephemerals such as bellwort, bloodroot, Jack in the Pulpit (Arisema spp. ), and trilliums. Combine it with other shade-loving plants such as small to medium hostas, astilbes, bleeding heart, columbines, hellebores, heucheras, lungwort and ferns where it will spread in and around the other plants, then fade into the background after flowering. Woodland phlox does best in partial shade and moist, rich, well-drained soil. 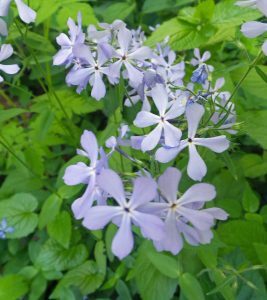 As its common name suggests, woodland phlox does best in woodland conditions in partial shade and rich, moist, well-drained soils. But it is very adaptable and will tolerate dry and clay soils, and is even drought tolerant once established. Although partial shade is best, it will tolerate full sun in cooler climates. 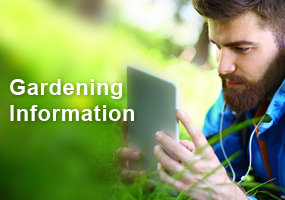 Mulch lightly to retain moisture and keep the roots cool through the summer. Prune after flowering if desired to tidy the plant’s appearance, but wait until spring to clean up the clump, only removing winter-damaged foliage. 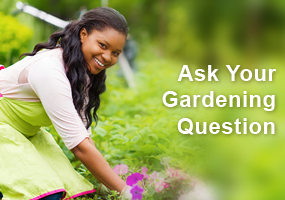 This plant has few pest problems, other than powdery mildew. Placing in areas with good air circulation and cutting the stems back after bloom can help reduce powdery mildew. Spider mites can be a problem in hot, dry weather. Deer and rabbits will browse the foliage. Woodland phlox is propagated by seed, division (detach rooted stems in spring or early fall), basal cuttings taken in spring, or root cuttings taken in early fall. 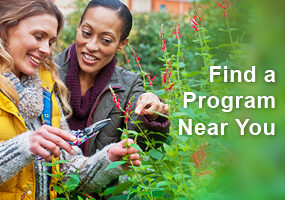 Seeds can be sown in spring or in mid-summer as soon as it is ripe. ‘Blue Moon’ – this New England Wildflower Society introduction has deep blue-violet flowers and very full flower petals. ‘Clouds of Perfume’ – a very fragrant type with blue flowers. ‘Chatahoochee’ in a garden (L) and closeup of flower (R). ‘Chattahoochee’ – is a cultivar of the subspecies laphamii with lavender flowers that each have a darker center. It received the Royal Horticultural Society’s Award of Garden Merit in 1993. ‘Fuller’s White’ – has white instead of blue flowers. ‘Louisiana Purple’ – has dark lavender to purple flowers with a maroon eye. It might actually be an interspecific hybrid. ‘May Breeze’ – was selected in the Netherlands by Piet Oudolf for its star-like pale blue flowers. ‘Montrose Tricolor’ – has lavender blue flowers and variegated leaves. I especially like the “Chatahoochee” cultivar with the darker center. I am going to try this out, along with my other shade plants. I have an area in my shady garden already filled with hostas, astilbe, bleeding heart and columbine. Phlox would be a beautiful addition! I’m going to give it a try next spring. I have some phlox in a shady setting, and am waiting for it to multiply. I think I will transplant some columbine around the phlox a little later this year. Thanks for the idea! We were in Kentucky this Spring and this was growing in large masses in the woods. Absolutely gorgeous. I didn’t know there were so many cultivars. I will be looking for it in our local nursery next Spring. Thank you. I have the Sherwood purple growing In my shady area. Beautiful flower, but viney weed varieties like to entangle themselves with it. Hard to separate it from the weeds without pulling some out. Thank you for the informative article. I am creating a small native prairie type garden in my backyard patio area that has a considerable amount of shade, so I’m searching for suitable plants and will try the woodland phlox and research the others you suggested as companion plants such as Jack in the Pulpit, Bleeding Heart and columbines. Thank you for the suggestion. I plan on using them in the wooded area in my backyard. I know these will give this area that used to be full of buck thorn a beautiful make over. Fantastic plants! I have them along my homes walkway & love the large burst of blooms. I am quite pleased to see many also are grown in woodland areas. Adding these to the list for our woodland & wetland areas as well! I have attempted to start Phlox divaricata from seed even though it is noted to be difficult and/or slow to germinate and grow to maturity. To date, I have had no luck. I will be searching for a couple of plants to purchase this spring and, in the future, will attempt propagation by the other methods mentioned in this article (division, basal cuttings and root cuttings). Having never had one of these plants, I was unaware that they were fragrant and that will be added bonus for the woodland garden. I wasn’t aware that Phlox are odoriferous. I haven’t grown them for a while due to the powdery mildew. Having just moved to Zone 5 in Wisconsin, I look forward to planting Phlox this year in the shade. Thank you. I have not seen this plant in our local woodland. I would like to try it as we live in a grove of hadwoods. However we do have a lot of deer in our area so I will try it close to our house. Woodland phlox is a showy and lovely addition to spring gardens. They mix well with spring bulbs and other woodlands ephemerals such as bellwort, trillium and bloodroot. As they are easy to grow in partial shade with rich soil they perform well in many natural areas and in more formal plantings. An added feature is their fragrance and value in attracting pollinators. May I take clumps of woodland plox from a wooded area in the forest to transplant into my garden bed? Will the plox thrive? I have this, along with many other woodland spring flowers, in my woods. I love walking through the woods in the spring when the undergrowth is still short and being surprised at all of the little beauties that I come across. This one tends to grow more towards the edges of my woods and sometimes along our ATV tails.